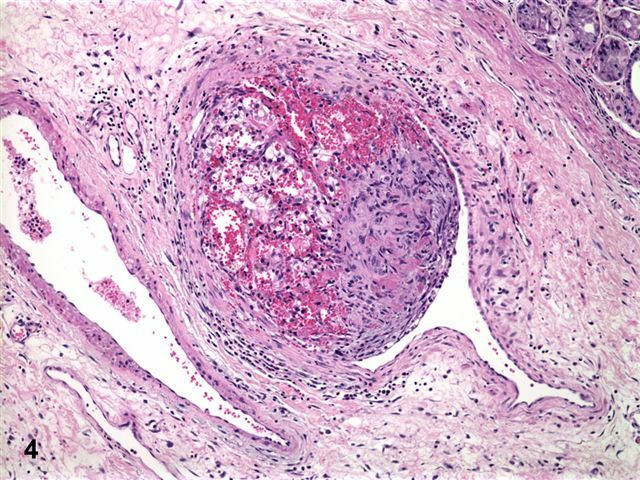 A 51 year old man presented to the Emergency Room with fatigue, shortness of breath and dizziness.� A complete blood count demonstrated mild anemia and a stool guaiac test was positive for occult blood.� Upper and lower gastrointestinal endoscopy showed polypoid gastric masses in the cardia, fundus, and antrum.� Biopsies revealed the pathology described below.� CT scan additionally demonstrated an enlarged lymph node in the gastrohepatic ligament, a 2.5 cm right adrenal mass, and an intramucosal lipoma in the jejunum.� The patient had a subsequent gastrectomy, esophagojejunostomy, and proximal jejunum segmental resection. 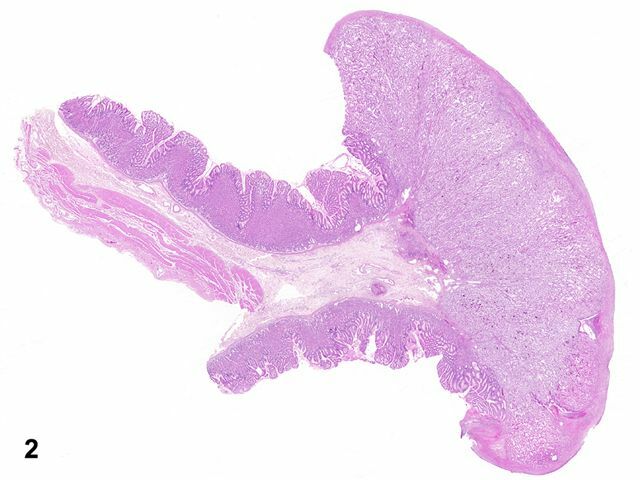 On histopathologic examination, the masses were confined to the mucosa and submucosa (figure 2) and consisted of sheets and nests of large, polygonal, clear cells, with distinct cell borders, medium-sized round-to-irregular nuclei with moderate pleomorphism and prominent nucleoli (figure 3).� Vascular invasion was present (figure 4).� The surrounding gastric mucosa showed ulceration, reactive changes and chronic gastritis. The most frequent sites of metastasis of renal cell carcinoma (RCC) include the lungs, bones, brain, and liver2,4.� RCC has also been reported to metastasize to the small intestine, pancreas, and thyroid5,2,6.� Although RCC has a propensity to metastasize to unusual sites, cases of metastatic RCC to the stomach are very rare.� Previous cases of metastatic renal cell carcinoma to the stomach have been reported, and have presented as discrete and ulcerated gastric masses4, 7, 8. 1.� Kobayashi O, Murakami H, Yoshida T, et al. Clinical diagnosis of metastatic gastric tumors: clinicopathologic findings and prognosis of nine patients in a single cancer center. World Journal of Surgery 2004; 28:548-51. 3.� Green LK. 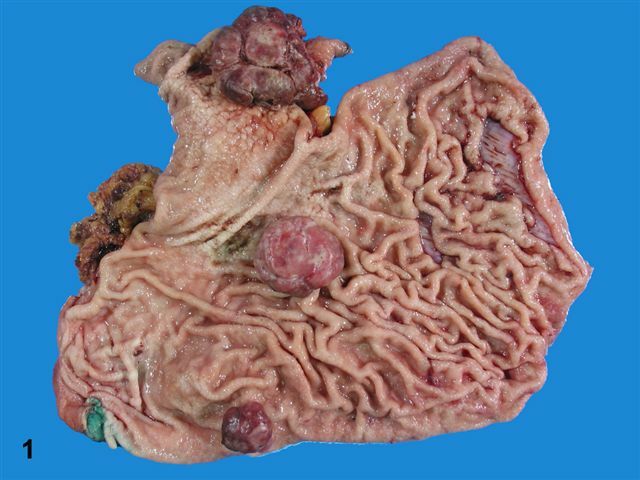 Hematogenous metastases to the stomach. A review of 67 cases. Cancer 1990; 65:1596-1600. 4.� Odori T, Tsuboi Y, Katoh K, et al. A solitary hematogenous metastasis to the gastric wall from renal cell carcinoma four years after radical nephrectomy. Journal of Clinical Gastroenterology 1998; 26:153-4. 5.� Chang WT, Chai CY, Lee KT. 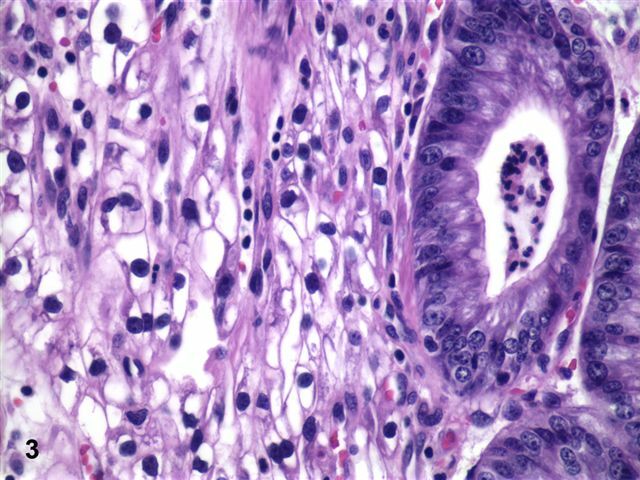 Unusual upper gastrointestinal bleeding due to late metastasis from renal cell carcinoma: a case report. Kaohsiung Journal of Medical Sciences 2004; 20:137-41. 6.� Norton KS, Zibari GB. Body and distal pancreatectomy for metastatic renal cell carcinoma: case report and review of the literature. Journal of the Louisiana State Medical Society 2004; 156:40-1. 8.� Blake MA, Owens A, O'Donoghue DP. Embolotherapy for massive upper gastrointestinal haemorrhage secondary to metastatic renal cell carcinoma: Report of three cases. Gut 1995; 37:835-837. 9.� Weiss SW, Goldblum JR, eds. Enzinger and Weiss's Soft Tissue Tumors, 4th ed. St. Louis, MO: Mosby, Inc; 2001:1323-1355.